Logarithmic values are extremely useful in finding products, quotients and in extracting roots of a higher order than 3. Logarithmic values can also be used in changing the base of a logarithm. Logarithmic tables are of the form given below. In the above table, the first column denotes the first two significant figures of the given number whose log is to be found. The next set of columns with 0,1 .... 9 at the head of the columns denotes the third significant figures of the numbers. The numbers given under the heads of the first eleven columns are the mantissa of the logarithms with the decimal point omitted. The numbers given under the heading “Mean Differences” are the approximate increments in the mantissa on account of the fourth significant figure in the given number. Find the logarithm of 24. The number consists of two digits before the decimal point since 24 = 24.0000. Characteristic of log 24 = 2-1 = 1. Find the logarithm of 193. The number consists of three digits. Characteristic of log 193 = 3-1 = 2. The third significant figure of the number is 3 and the fourth is 0, the mantissa of 193 is that given in the row containing 19 and in the column headed by 3. From the table, this is 2856. The number has four digits. The mantissa of the number is that given in the row containing 21 and in the column headed by 4, it is increased by the number given under the head 7 of the mean difference, with 7 being the fourth significant figure. There is only one digit before the decimal point. The characteristic of log 2.356 = 1-1 = 0. The numbers 2.356 and 2356 have the same significant figures and hence their mantissae are the same. So the mantissa is found in the row containing 23 under the column headed by 5 for the third significant figure and is increased by the number given under the head 6 of the mean difference, 6 being the fourth significant figure. 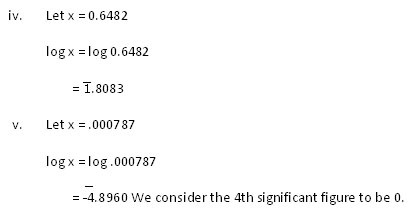 In obtaining a logarithm, we need four significant figures. If a number has more than four significant figures, we round off the fourth digit to the nearest integer. So when we need to find the mantissa, 240562 becomes 2406. The number has six digits. The characteristic of log 240562 = 6-1 = 5. The mantissa is obtained in the row containing 24 under the column headed by 0 and is increased by the number given under the head of 6 of the mean difference. The mantissa is 3802 + 11 = 3813.